As a forerunner to India’s leading and Delhi’s most awaited ‘athletic event with a social conscience’; Hon’ble Chief Minister of Delhi and Chief Patron of the event Shri Arvind Kejriwal along with representatives from the Title Sponsor Airtel and Procam International launched the registrations for the eighth edition of Airtel Delhi Half Marathon. On Sunday, November 29, 2015, the city will witness the overall 11th edition of an event that has helped Indians break running ground since its inception. Thereafter the press launch for the 8th edition of Airtel Delhi Half Marathon was conducted at Le Meridien hotel, the event’s Hospitality Partner. Registrations were announced, in the presence government dignitaries, Sarang Kanade, Hub CEO – Delhi NCR and Rajasthan, Bharti Airtel; Rishi Patnaik – Director Sports Marketing, Jabong; Sapna Desai – Cigna TTK, Head – Marketing and Communication; Vikram Alhuwalia – Brand Head, Consumer Health Care Products, Sun Pharmaceuticals; Dr Tamorish Kole – Senior Consultant & Head, Department of Emergency Medicine, Max HealthCare; Yatish Meherishi – Chief Revenue Officer – Radio Mirchi; Murray Culshaw -Chairperson, India Cares Foundation, Abhirup Dutta – Head Sales & Marketing, TUI India; Anil & Vivek Singh – Procam International; along with Face of the event Bipasha Basu. In addition to the feature race, the USD 270,000 prize money event will also include the ‘DHL Corporate Champions’ (21.097 km), Great Delhi Run (6 km), the Senior Citizen’s Run (4 km), and the Champions with Disability (4 km). On the occasion, Sarang Kanade, Hub CEO – Delhi NCR and Rajasthan, Bharti Airtel, said, “We are truly excited to be a part of Airtel Delhi Half Marathon, as it fosters our core brand essence of human connections and brings thousands of people together to celebrate the spirit of running. Like every year, we are confident that ADHM will see the people of Delhi brave the winter chill and run – or simply be there to cheer for their family and friends. We look forward to making the 8th edition of the race bigger and better and invite everyone in Delhi to be a part of this special sporting event – the Airtel Delhi Half Marathon”. This year’s marathon is expected to witness participation from over 32,000 runners including some of world’s best professional athletes, health & fitness enthusiasts, and amateur runners from across India and different corners of the world. One of the fastest half marathon courses in the world, the route offers runners a beautiful glimpse of the historic city, that includes Parliament House, Rajpath, India Gate, Delhi Golf Club, Lodhi Road and Sansad Marg and inspires them to brave through their obstacles and challenges. NEW THIS YEAR: For the eighth edition, timing major SEIKO is onboard as the Official ‘Timing Partner’ for the Airtel Delhi Half Marathon 2015. This is SEIKO’s maiden alliance with the prestigious Half Marathon. With this partnership, all three Procam distance running events join the ranks of international sporting events such as the Olympics, the Commonwealth Games, the IAAF Athletics World and the FIFA World Cup, all of whom SEIKO has provided its timing technology and served as Official Timer. The DHL Corporate Champions is gaining tremendous popularity among organizations and is being viewed as a highly effective team building exercise for employees. In order to enhance this category further and boost participation, there is additional prize money of Rs 10,000 each for the fastest male and female in the category. The timing certificate preference criterion in the Airtel Delhi Half Marathon has been growing leaps and bounds over the years and has helped elevate the level of the half marathon field. 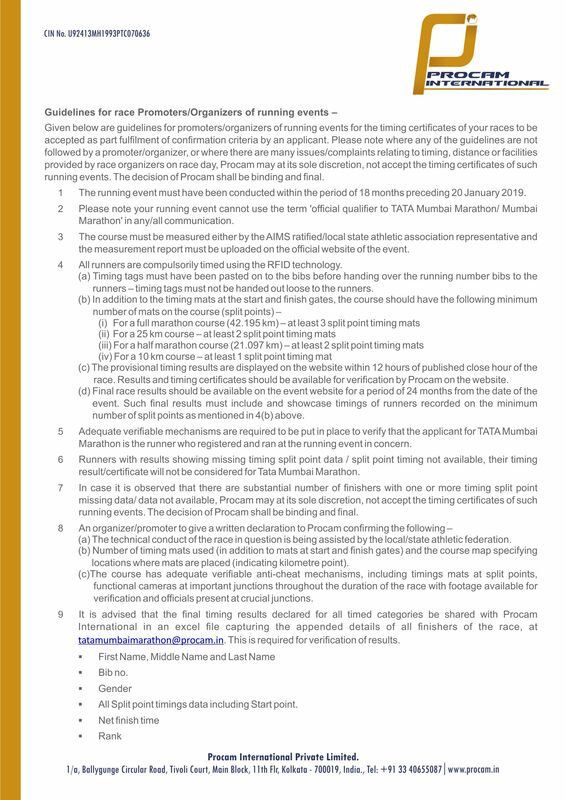 Going further, ADHM recognizes the efforts of the serious runners by offering priority starts to participants based on their timing certificate. The timing certificate will also ensure that the applicant gets preference over non-timed participants in the registration process. To increase women participation, there are limited numbers of running places reserved for them. On race day, runners will be divided into five sections. TUI stores at in Delhi & NCR (between 11 am & 6 pm): (1) G-60, Ground Floor, Select City Walk Mall, A-3, District Centre, Saket New Delhi – 110017; (2) Shop No- SF 068, First Floor, Galleria Market, DLF-IV, Gurgaon, Haryana- 122009; (3) Shop No. 49, First Floor, Vaibhav Khand, Shipra Mall, Indirapuram, Ghaziabad (U.P. )- 201014. For further details contact the event helpline number +91 96500 33333, which will be open from 10 am to 7 pm, Monday to Saturday. Toll-free for Airtel subscribers and chargeable as per standard call rates for non-Airtel subscribers.